Isaac Colvin from Colvin Family Farm gives Brussels sprouts to a customer. On Saturday I told Charlotte Tolley, the manager of the Market Square Farmers’ Market, that I don’t remember seeing this much produce at the market at this time last year. She said I was right. There previously wasn’t this much volume or this much variety this close to the end of the season. The Market Square Farmers’ Market, in its eighth year, will be open only two more Saturdays this year. Then it will convert to a Holiday Market with craft items and prepared foods. This has been the market’s biggest year yet. Tolley said, at its height, there were 150 vendors. Vendors come and go throughout the growing season depending on what they are offering and other commitments they have. “Some just have apple orchards,” she pointed out. “They might only be here three weeks.” Some skip weeks based on the weather or the UT football schedule, which can have a huge impact on the market. This beautiful - and healthful -- savoy cabbage was at the Mountain Meadows Farm booth Saturday. It’s an interesting dynamic among vendors at the market. “They work together,” Tolley noted. “But they are in competition. As they get more experience, they figure out how to set themselves apart. They figure out what they do best.” This makes for a wonderful opportunity for shoppers. Alan and I have purchased vegetables we never have tried before. It’s fun. The growers themselves will explain to you how best to prepare an unfamiliar item. The folks at Hines Valley Farm, for instance, coached me on how to prepare kohlrabi, which was good and a nice departure from turnips. When we go to the Farmers’ Market, we make it a point to patronize the growers who use either organic methods or, at least, “natural” methods that exclude the use of pesticides. I find myself getting a little personally offended by the growers who spray poison on the food and then look me in the eye and try to sell it to me. Tolley said about 70 percent of the produce vendors at the market use “some kind of organic practices.” Signage at each booth indicates when the produce is grown using special methods. If it doesn’t say so on a sign, assume the farm uses conventional methods including powerful pesticides. The meat purveyors, on the other hand, all use some kind of sustainable methods, Tolley said. Some are organic. Yes, the organic products are more expensive. And sometimes the produce doesn’t look as perfect. But I feel better about it. Tolley says there will be challenges next year. As more retailers and restaurants move to the Market Square, Market Street and Union Avenue areas, the space to put up stalls on sidewalks may get a little more short in supply. When Lime Fresh opens in the Arnstein Building, for instance, the proprietors my need its sidewalk space to remain clear. And that’s where the Farmers’ Market’s own booth currently is located. But Tolley will use the winter to find solutions and talk to folks about possible alternatives. There’s a parking lot she’s eyeing, for instance. I have confidence she’ll work something out. One thing that, unfortunately, won’t be worked out is the return of the popular Market Mixer cocktail contest. State alcohol authorities this year shut down the monthly contest, which allowed patrons to pay a flat fee and then stop by participating restaurants who competed to make the best cocktail using a specific ingredient supplied by the Farmers’ Market. It was illegal, apparently, on many levels. But it sure was fun! We are sad to see the Farmers’ Market come to a close. We look forward to May to see what new and old delights our grower friends will come up with. Until then, here’s a look at our very favorite vendors at the Market Square Farmers’ Market. John Ledbetter and Diana Hun at Hines Valley Farm offer great produce -- and advice! Their vegetables are certified organic. 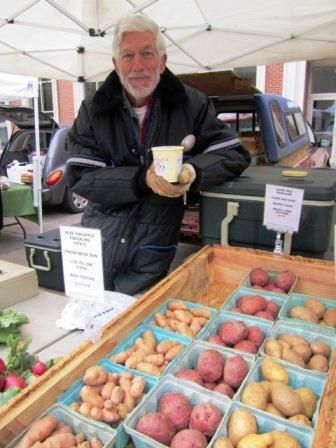 Almost every Saturday we have bought potatoes from Bob Due of Terraced Garden Farm in Claiborne County. Even though it was so chilly he had to wear this coat, on Saturday Bob was still having his Cruze Farm ice cream! Every week we buy a gourmet loaf of bread from Rick and Mary Ann Rickerman. My favorite is jalapeno cheddar; Alan likes the herb. Why go to one bakery when you can go to two? We also get sliced wheat bread from VG's Bakery almost every week. This is Kamie Jett selling us our loaf last Saturday. Every Saturday we visit Shannon Meadows from Mountain Meadows Farm near Norris. We always get tomatoes. And usually some other veggies and fruits, too. You don't see this at Kroger. But you do at Mountain Meadows Farm. The guys at Colvin Family Farm are so friendly and helpful. Here is a link to a great story the News Sentinel ran about their farm. Click here. Adam Colvin chats while he works. We buy something from them almost every week. I can’t say enough about Greg Blankenship at Gregory’s Greenhouse. When we moved from the suburbs to downtown, the only thing I really missed was my herb garden. Greg planted me one in a beautiful container. We have used those herbs all summer and fall and think of him whenever we do. His motto is “beautifying Knoxville one container at a time!” We highly recommend him for his great seasonal container arrangements, among other things. Greg Blankenship with a pretty little holiday plant. I bought these paperwhites from him on Saturday. He said to store them outside and bring them inside two weeks before my annual cookie party, which is next month. They should bloom just in time. We'll see! Alan can't tolerate spicy foods, so we can't really buy many of the beautiful peppers offered by Rushy Springs Farm. But we have bought their onions all season long. This is Rose Najar. I've bought two beautiful sets of gourds from her. But lately she's been selling hand-painted pieces of slate, which make great hostess gifts. Marble City Glass Works has a beautiful booth. I've got my eye on some of their whimsical birds. Jeffrey Key was staffing the Sweetwater Valley Farms cheese booth Saturday. We usually make a purchase. Almost every Saturday without fail we buy a dozen eggs from J.D. Dimick of Happy Harvest Farm in New Market. He wasn’t at the Market this past Saturday, but here’s a photo I took of him last October. Thanks so much to the great folks who keep the Market Square Farmers’ Market running smoothly. From left, volunteer Art Carmichael and staffers Kimberly Pettigrew and Charlotte Tolley. John Schmid is another Market volunteer. He posed here on Saturday with mayoral candidate Madeline Rogero who was visiting the Market. We ran into our buddies Ellen and David Keim taking advantage of the Market Square Farmers' Market Saturday as the season winds down. Here are links to websites of some of those vendors mentioned here. Click on the name. If you don’t see a link, it is because the vendor didn’t have a website or I couldn’t find it. Hines Valley Farm, Terraced Garden Farms, Cheesecakes and Breads by Rick, VG’s Bakery, Mountain Meadows Farm, Colvin Family Farm, Gregory’s Greenhouse, King’s Hydrofarm, Marble City Glassworks, Sweetwater Valley Farm. ← Attention! Great art alert! It’s going to b a long winter without the Farmers’ Market. I see lot of beans & rice in our future. I missed the brussels sprouts on Saturday & will definitely look for them this week. Thanks for a great story on our fabulous Market Square Farmers’ Market. Had breakfast at Pete’s on Saturday and was so surprised to see the Farmer’s Market still opening and bustling this late in the season. Thanks for asking that question. I wondered why they are open so late this year. I am thrilled that they have added the fall crops. They are some of my favorites! Gay: I so agree with you. I’m actually getting a little depressed knowing the Market is coming to a close. Who would have thought I would develop such strong feelings for it? A girl from the suburbs like me! Tami: I agree with you about fall crops being some of my favorites, as well. Guess we have two weeks to snap them up! Charlotte, Kimberly and Art have done a tremendous job growing the Market. Charlotte is on the leading edge of programs and best practices for Farmers’ Markets across the nation. The Market Square Farmers’ Market is non-profit and financially self sustaining. It is one of the best things Knoxville has to offer and is an authentic representation of who we are as a community. I have to share one of my favorite items I tried from the Farmer’s Market this year. Elizabeth Malayter raises goats and my kids (ha ha, meaning children, not goats) loved eating goat meat when they were in Greece. I decided to give it a try. I bought my first batch of goat stew meat earlier this summer and fixed a goat stew in my crock pot with a recipe from Robert Irvine. It was absolutely delicious (declared by even the most skeptical) and a perfect crock pot recipe since it requires a long, slow cooking process. I have bought more to have later this winter. I wholeheartedly recommend you try her goat meat! Very tender, mild tasting and easy to make. John: you are right about what a great job Charlotte, Kimberly and Art have done. Alan and I are very grateful to them. Danni: Hats off to you, girlfriend! Love your adventurous spirit! I’ll miss our Farmer’s Market friends and their wares this winter. Hey, Danni, do you like goat cheese too? I enjoy going by John Dimick’s place. I’ve known him since he and Carla were at Bearden High School together. Haven’t bought any eggs but have bought lots of veggies. Yum, yum. Also enjoy Bob Due’s potatoes. Georgiana: Both those guys are so nice. Great article Cynthia! As a first-time, full-season art vendor at the Market Square Farmers’ Market it was a fabulous experience to meet so many new people over the course of the season. I am excited to be a part of the Market again next year and look forward to its growth- both in size and maturity. Knoxville is very lucky to have Charlotte heading up our wonderful market. She and Kimberly and Art make my Saturday’s awesome! You know, Mox, you should put pictures of the good-lookin’ people up higher. Not that anyone in your montage was unattractive in the least, of course. David: Yes, we thought Ellen looked great! Lisa: Thanks for the comment. I will look for you next Saturday. So sad there are only two left. I couldn’t agree more with all of your recommendations and other’s comments about the Farmer’s Market. I’m a regular patron. It is a great treasure for all of Knoxville (especially downtown residents) and will be sadly missed until next year. VG’s English Muffin Bread rocks! I love to come down early on Saturday morning to get a jump on what’s available and to beat the crowd– can’t wait until Spring!